Home » PCB Design » Switching vs Linear Voltage Regulator: What’s the Best Choice for Your Power Management Circuit? Have you ever had a capacitor explode right in your face? That’s how I started my career in electronics design. I also messed up the power budget calculation for what was initially pitched as a “simple” project. The end result was a PCB prototype with a red hot voltage regulator that was capable of frying an egg...or worse. Since then, I’ve come to realize that design elegance and sophistication matters little. If you make an error when configuring the power management circuits, your design is virtually useless. Power budget calculations, the temperature of the environment, and, in my case, the choice of core power management component, like a voltage regulator, can make or break your PCB project. In over a decade of designing embedded systems, I’ve seen microcontrollers evolve by leaps and bounds. They’ve gone from the historic Zilog to the modern Cortex M4 processor. Technology like Bluetooth LE and ZigBee have gone on to further revolutionize the embedded systems industry. However, you’ll always need well-designed power circuitry. Without it, these cool bits of technology are just “parts”—parts that’ll smell terrible when they start to sizzle, melt, and burn. Capacitors aside, you have the voltage regulator, which sits at the heart of all well-designed power circuitry. As the name implies, it provides a stable source of voltage that allows the embedded system to operate in a stable manner. Voltage regulators work by receiving a high voltage input before lowering and stabilizing the voltage to the level that’s required to operate the electronic device. Before 3.3V components became popular, we were limited to 5V powered microcontrollers (MCUs) and integrated circuits (ICs). LM7805 was a popular part number back then, as it was a simple 5V linear voltage regulator. In fact, its simplicity is quite elegant, making it still a popular choice today. When 3.3V became a mainstream operating voltage, LM1117-33 served as a fairly efficient linear voltage regulator. There was a period when integrated circuits shifted to accommodate 3.3V, and during this time, microcontrollers underwent a phase of rapid evolution. Previously designers focused on the number of inputs/outputs on a microcontroller. Then they became more interested in the number of integrated features, such as UARTS, Ethernet, USB, and the rapidly increasing processing power. Eventually, the linear voltage regulator was pushed to its limit. These handy heatsinks cool down linear regulators. Many people made a rookie mistake when dealing with linear voltage regulators, they accepted the current rating as absolute. This was a major problem because the LM7805 voltage regulator is specified as a 5V, 1.5A. But that doesn’t mean it can handle this voltage without melting a few components, at best, or burning up in the process. At least three more parameters must be considered before selecting a linear voltage regulator. The dissipated power level is calculated by considering the difference between the input and output voltage; then you multiply this figure with the load current. If you’re regulating 12V to 5V, and your embedded system consumes 100mA, then the dissipated power will be 0.7W. With this in mind, we should note that the LM7805 can operate at temperatures up to 125°C. Beyond this point, you’ll begin to see undesirable events such as melting and burning. But a typical LM7805 in a TO-220 package has a temperature resistance of 65°C/W. This means that for every 1W, you will see an increase of 65°C on top of the environment’s ambient temperature. In some regions, temperatures average around 35°C, so the LM7805 would be running at 100°C—slightly short of its allowed maximum temperature, yet you have less than 10% of the rated maximum current of 1.5A. The linear voltage regulator’s characteristics made it a less-than-ideal candidate in high power requirements systems, since the heat generated could damage the regulator or deteriorate the lifetime of nearby components. This increased interest in the switching regulator. As the name implies, the switching regulator switches on and off at a very rapid pace, providing a stable and efficient source of power. The switching regulator can dissipate heat quite effectively, reducing temperatures and minimizing the risk of a literal meltdown. Switching regulators are all about efficiency. A part that I’ve used is the LM2576, a popular switching regulator that runs at 75% efficiency when regulating at 3.3V. This produces a fraction of the heat that you might see from a comparable linear regulator, making it ideal for applications that need to regulate from a high voltage to a low one. It’s also suitable for embedded systems where you’re routinely running at a high capacity. With all the efficiency that a switching voltage regulator provides, two criteria still prevent it being the default choice. The cost of the switching regulator and the mandatory passive components. These can be significant, and up 30 times higher than the costs that you’d see with a linear voltage regulator and a couple of capacitors. Also, the switching regulator requires more passive components. 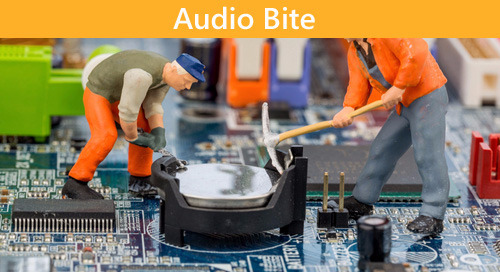 When you have a greater number of passive components, maintenance become far more complex. You must ensure that you carefully select the value of your inductors and capacitors, and this also automatically translates into a demand for more space on the PCB. In short, if you are working on a simple application that doesn’t consume much power, the linear voltage regulator is the logical choice. But if you’re working on a high-powered project or attempting to step down from industrial voltage of 24VDC to a 3.3V system, then you may want to consider using a switching voltage regulator. Have questions about power management circuits? Do you need tips and best practices for switching voltage regulator design? Contact an expert PCB designer at Altium now.